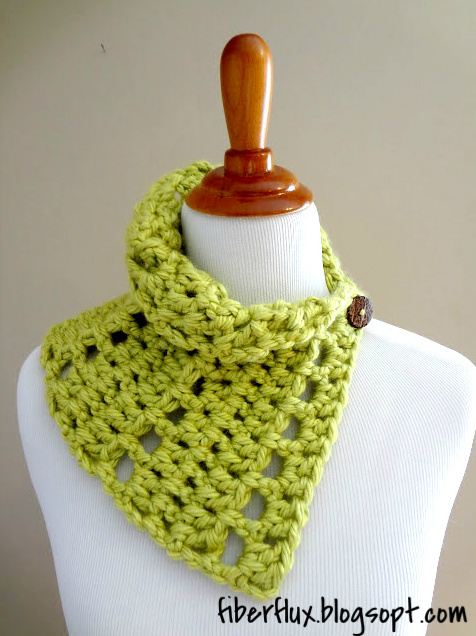 The Key Lime Neck Wrap is a pretty accessory that adds a splash of color to a gray day. A simple stitch sequence with a pretty eyelet row is super simple for beginners, but is equally engaging for seasoned crocheters as well. Worked with a large hook, the result is a very quick project that is warm, lofty, and beautiful. 1 Skein Lion Brand Hometown USA Solids, 81 yards (Colorway shown: "Monterrey Lime") (Note: If you choose to use some of the tweeds and prints in the Hometown line, be sure to check the yardage, some of them are only 64 yards, so you'll need more than one skein). Foundation Row: dc in the 4th ch from hook, 1 dc in each ch across row. Row 1: Ch 3 and turn, dc in first space and each space to end of row. Row 4: Ch 3 and turn, dc in first space and each space to end of row. Repeat rows 2-5 until length is reached (see sizing above). Before sewing the button to your neck wrap, test it first by slipping it through one of the eyelet holes to make sure it is the correct size. Sew button onto the bottom corner (as shown below) and weave in any ends. Check out all the ways to wear your neck wrap...try spinning it around with the button in the back for a cowl/turtle neck look. Or, wear it with the button in the center for a collar-like shoulder wrap. Thanks Jennifer, you are amazing. And you are so lovely with your kind words...hugs! Your pattern is really nice - thank you. Love the colours that you've used for both and definitely what we need for the winter! Thanks! I thought that pretty green would be nice for when the days are gray and cold...nice little pop of greenery! 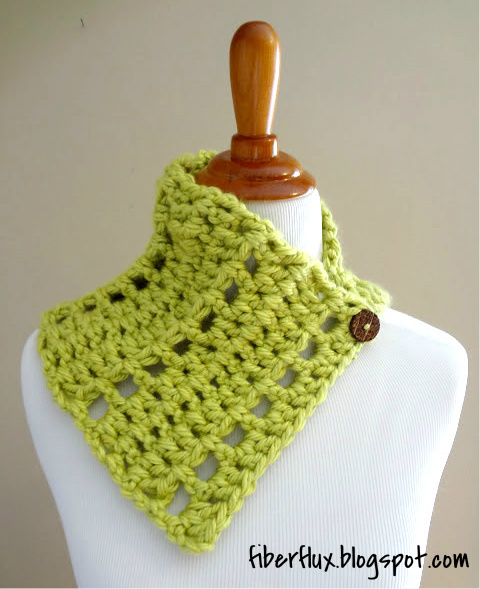 Oh, I just love this key lime neck wrap. Can't wait to start! Yipee, I finished it in about 2 hours minus the button! Excited to link my work with yours. I only have thanks for you! First, I have to say I just LOVE your blog. It is one of my favorites to look at. You have amazing posts and patterns and I thank you! I made the neck wrap (two of them) and both times ran short of yarn by one whole rotation of the pattern. It happened twice so I am wondering if I am doing something wrong. I tend to knit tightly so I was surpised that this happened. I don't mind buying two skeins as I can use extra for a little scarf that I can donate. Is it just me? Thank you again for all you do! Thanks for your great question! I did a little research and found that some of the prints and tweeds in the Hometown line have a different yardage than the solids. The solids measure 81 yards and the tweeds and prints measure only 64 yards. Maybe it could be that? I updated the pattern with a special note too for others making their yarn selections. I hope that helps! I love your work! Im just starting to crochet and I adapted your key lime neck wrap to work with my yarn and skills. I used Vanna's choice Lion Brand in Barley (because I had it) and chained approx 75 (I started at 100 and pulled stitches back out until it seemed right on me, I measured in the mirror, the beauty of crochet is that we can do custom work!) I did the foundation row and row 1 per your instructions and then I alternated between single and double crochet rows ending at 6 1/2 inches wide, 21 inches long. Its my profile photo. I cant wait to try some of the chunky yarns using your patterns. Thank you for sharing! I LOVE the Barley colarway...yours sounds like it's going to be gorgeous! Have fun and happy crocheting! Love this one. I can't wait to make it! Ok, I am half way through after an hour and I LOVE it! I will be making more as Christmas gifts. Thank you for posting this pattern. This is such a lovely pattern. 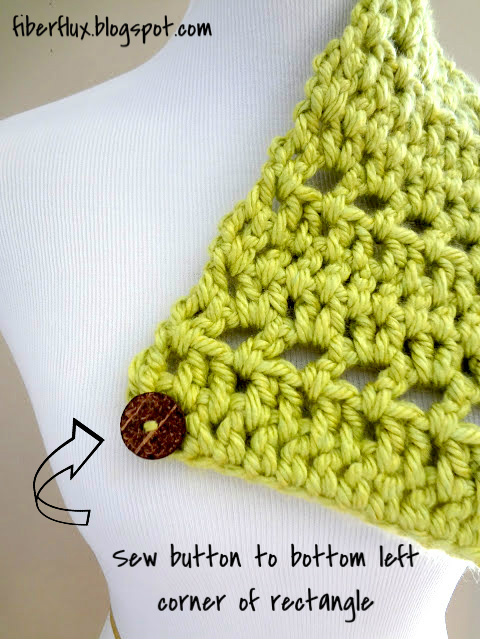 I am a rusty "beginner" and found this a good way to return to crocheting after many years. A couple of false starts - one, due to not being loose enough with my tension (6" width as opposed to a more relaxed 7-5 to 8") and Row 4 - it wasn't quite clear to me that I was to DC inbetween each of the 2DC's from the previous row. However, your excellent photos showed me were I went wrong. I crocheted with "Katia Montezuma", and used a toggle as the fastening. I used approx 70 grams of the wool/acrylic mix. I'm wearing my creation as I type. First attempt came out huge with the N hook so third attempt I used an L hook and was much better but still about an inch bigger in length and width than your measurememts...it looks really cute with the top folded down like a collar!